Map of the Cities of New york brooklyn Jersey City Hudson City and Hoboken. 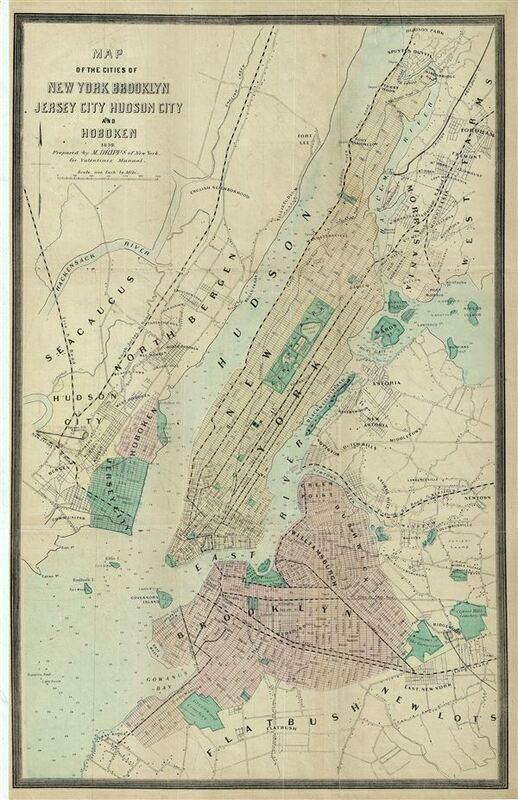 This is a fine example of the 1859 Dripps map of the cities of New York, Brooklyn, Jersey City, and Hoboken, issued for Valentine's Manual of the Corporation of New York. The map covers the entirety of New York City, including Governors Island, ellis Island and Rickers Island. Roosevelt Island is here named Blackwells Island and Liberty Island is identified by its original name, Bedloe's Island. Where Columbia University now stands, this map reveals a 19th century Lunatic Asylum. Fort Washington and Fort Lee are both identified. The map further identifies various canals, parks, reservoirs, train lines, ferry lines and important buildings. This map was prepared by Matthew Dripps for the 1860 edition of D. T. Valentine's Manual. Valentine's Manual of the Corporation of the City of New York, (1860 edition). Very good. Original fold lines visible. Professionally flattened and backed with archival tissue.